Recipe: Boar's Head Boldest Bracket Challenge & Food Hussy's Sandwich! | The Food Hussy! Recipe: Boar's Head Boldest Bracket Challenge & Food Hussy's Sandwich! March Madness is just around the corner - and you know what that means?! It's bracket time! This year though - it's not just for basketball games - this year - Boar's Head is bringing you the Boar’s Head® Boldest Bracket Challenge! I decided to get in on the action and came up with my own sandwich - the Food Hussy Sweet, Spicy & Melty Chipotle Chicken Sandwich! Boar's Head has come out with a whole new line of BOLD meats and cheeses - things like Blackened Turkey and Horseradish Cheddar Cheese! They all sound delicious and are readily found at grocers and deli counters around the tri-state. The Boar’s Head® Boldest Bracket Challenge is not just for exploring new sandwiches - when you vote you can win too! You could win t-shirts, gift cards and even an iPad Air just for voting for me! You'll be able to vote for this delicious sandwich on Saturday March 8! Mark your calendars now - I think I'll even have a Facebook event for it. I made this a couple of times and both times we all agreed - THIS IS ONE GREAT SANDWICH!! Larry even had it for breakfast one morning (good lighting in the morning). 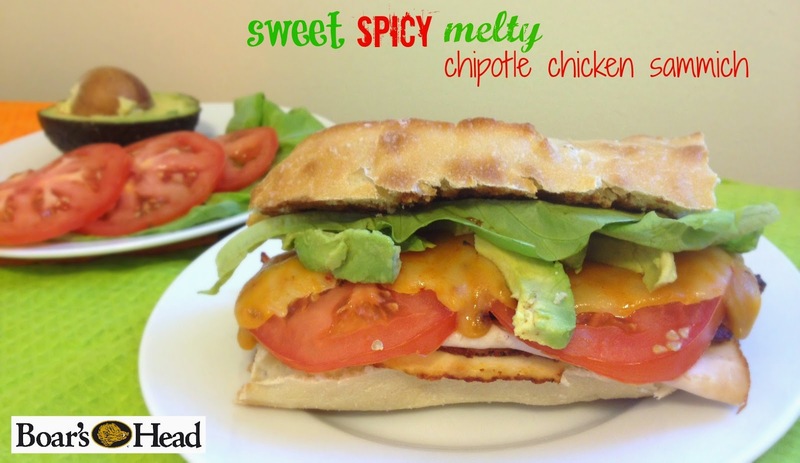 So be sure you vote for my sandwich on MARCH 8 in the Boar’s Head® Boldest Bracket Challenge! And hey - vote every day so you can win, win, WIN! And be a dear - share this contest with all your friends! Why? Cuz my sandwich is da bomb diggity of course! Tag it with #BHBoldestBracket so I can find it and share it with my friends too! Combine the spiciness of Boar’s Head Chipotle Chicken & 3 Pepper Colby Jack cheese with Boar’s Head Sweet & Mild B-BQ Sauce in a delicious sandwich. Smoky bacon, cool avocado & crisp lettuce add crunch and cool to this spicy, delicious sandwich! 7. Remove from oven and top with mayonnaise, bbq sauce, avocado and lettuce.